Replace your OEM Decals with these Classic Chevy or GMC Z-71 Off Road decals for your truck. 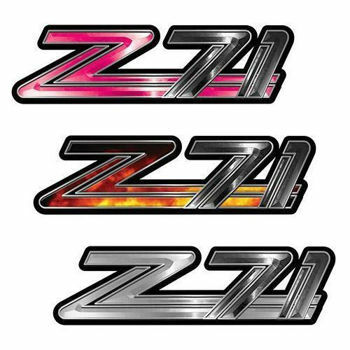 This style of Z71 decal was used on the 1999 to 2001 GMC and Chevy Pickups. Although they didn't have a long run with this design they look great on any year pickup. Professionally designed to look great with both Reflective and Non Reflective Options Doesn't matter if it gets buried in the mud or never leaves the steet this design will set you aside from the rest. Made from the best equipment and materials available these graphics are vivid in color and will look great and last for years without hassle.